I had a 540c out to play with for other reasons, and noticed it only had a 16MB card on it. The card had RAM chips all on one side, none on the other, but had solder pads for more RAM chips, capacitors (presumably decoupling capacitors? ), and a couple spots at the bottom near the connector for resistors. Well, it turns out what I thought were resistors were just 0 ohm jumpers for configuring the memory. I decided to rummage through my box o' ram to see if I had any old sticks that had the same ram chips as the card was using. It turns out, I had some old Sun ram (SS20 era, 32MB I think? Not large enough to max it out). 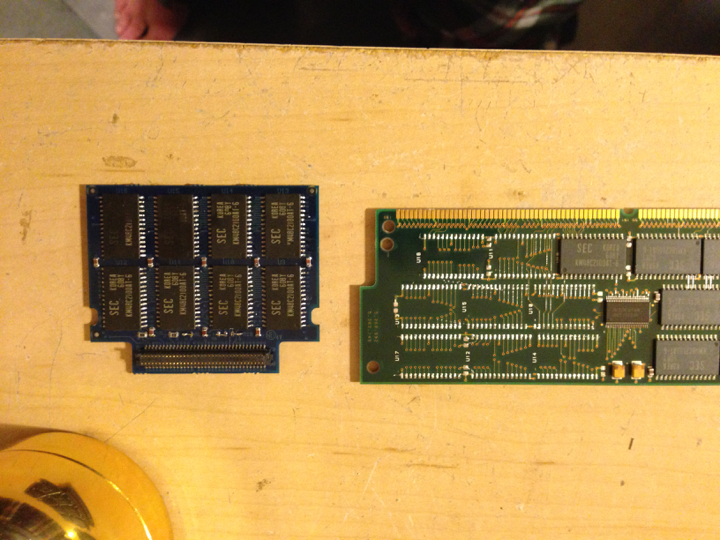 So I desoldered those chips and their corresponding capacitors, and soldered them to the back of the 16MB ram board. Next up was configuring those jumpers at the bottom to recognize 32MB instead of 16MB. For 16MB, the card had pin 12, 18, and 17 jumpered. So, for anyone else doing this, look for jumper pads that lead to those pins on the RAM connector. Comparing to a 32MB card, it had those jumpered plus jumpers for pin 20 and 19. I didn't have any 0 ohm resistors, so I just used bits of wire to jumper the connections. Once I installed those jumpers, the machine booted up, happy chime, ram test passed, and 36MB showing in the About This Mac dialog. Woo. Can you show a closer photo of the jumpers that you connected with highlights? If you have the before and after photo for comparison is even better. I really want to do something like this but I am not good with a soldering iron yet.